Therese Patricia Okoumou climbed the statue in protest of the Trump administration’s immigration policies. The protester who climbed the Statue of Liberty, forcing the evacuation of Liberty Island on the Fourth of July, pleaded not guilty to several charges in federal court on Thursday. Therese Patricia Okoumou, 44, ascended the statue at about 3:15 p.m. in protest of the Trump administration’s immigration policies. She was taken into custody following a three-hour standoff with police, and faces charges of trespassing, interference with government agency functions and disorderly conduct, per the U.S. Attorney’s Office of the Southern District of New York. After her brief arraignment on the three misdemeanor charges, Magistrate Judge Ona Wang ordered Okoumou to be released from federal custody. She is due back in court on Aug. 3. Greeted by cheers from supporters outside of federal court, Okoumou thanked the U.S. Park Police for their courtesy and professionalism, but said the government’s “draconian policy” on immigration had to end. In a statement released before Okoumou’s appearance in federal court, U.S. Attorney of the Southern District of New York Geoffrey Berman called the Staten Island resident’s actions a “dangerous stunt” that endangered many lives and alarmed the public. 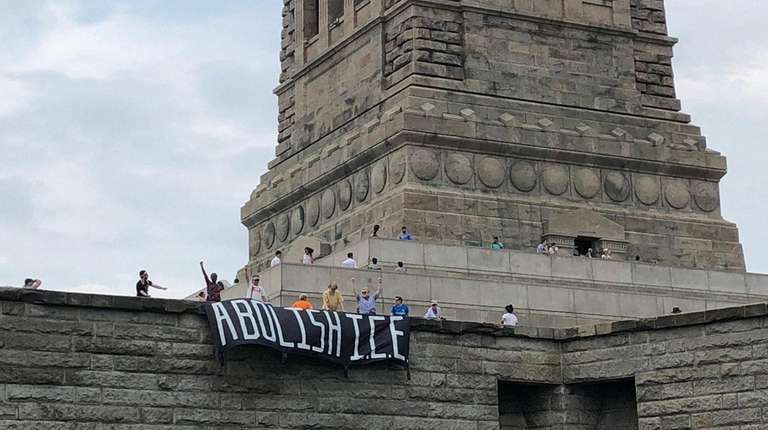 The incident on Wednesday began shortly after seven people with the activist group Rise and Resist were issued summonses for dropping a banner emblazoned with the words “Abolish ICE” from the top of the monument’s base, according to National Park Service spokesman Jerry Willis. Det. Brian Glacken, one of the members of the NYPD’s Emergency Service Unit who climbed up to get Okoumou, said she mentioned “the kids in Texas,” an apparent reference to the immigrant children who had been separated from their parents at the U.S.-Mexico border under the Trump administration’s zero-tolerance policy. “She didn’t really elaborate too much into it,” Glacken added. Okoumou was at first threatening to push Glacken and another officer, Det. Chris Williams, off the statue, but they were eventually able to bring her down safely at about 6:30 p.m. Glacken and Williams were harnessed, and about 14 other ESU members were below assisting them as they made the dangerous climb. “We took our time to basically get a dialogue with her, get a rapport with her so she would trust us,” Glacken said at a Wednesday evening news conference. She later apologized to the detectives “for having to go up there to get her,” Glacken said. Rise and Resist initially denied Okoumou was connected to the organization, but a member later confirmed she had taken part in the unfurling of the “Abolish ICE” banner. Walker said he had no idea how Okoumou was able to get up onto the statue. Rise and Resist later released another statement calling Okoumou an “amazing woman” and arranged a pro bono defense attorney for her. “We unequivocally support Patricia,” the statement said. The protest comes as many Democratic lawmakers, including Sen. Kirsten Gillibrand, Sen. Elizabeth Warren and Rep. Nydia Velázquez, have voiced interest in disbanding ICE. ICE, along with U.S. Customs and Border Protection and the U.S. Justice Department, has been involved in handling the Trump administration’s now-reversed family separation policy. Okoumou, who came to the U.S. from the Republic of the Congo in 1994, was previously charged with recklessly causing physical injury, criminal trespass and obstructing government administration for an incident in August 2017, according to court records. 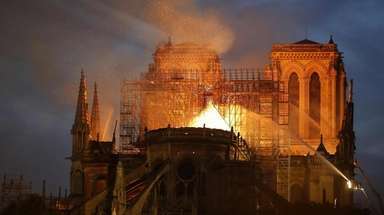 Further details regarding the case were not immediately available. The Statue of Liberty National Monument resumed normal operating hours on Thursday, the National Park Service said. How do they clean the Statue of Liberty?The statue has not had a proper bath in over 130 years. Why can't we go up the Statue of Liberty's torch? It can be disappointing, but there's a reason for it.